Do you have Christmas traditions that you do with your family? We have several traditions that we do every year like driving around to look at Christmas lights, visiting Santa, and baking our famous sugar cookie recipe. In order to have fun all through the holidays, we usually stick one of our Christmas traditions into our advent for kids. I made a free printable where you can simply save and/or print this list with a super cute font all ready to go so you just need to print and cut the papers into strips. However, if you want to make them extra cute, check out what I did below. 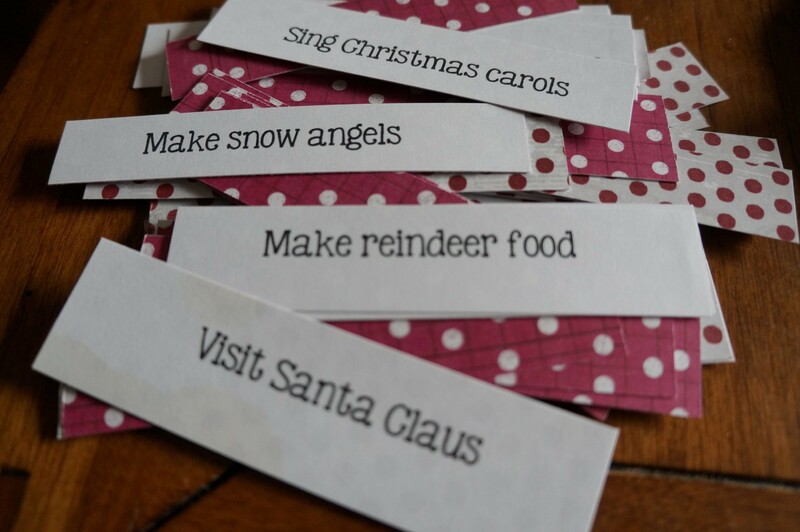 Print our our printable list of Christmas activities on a plain white piece of paper. 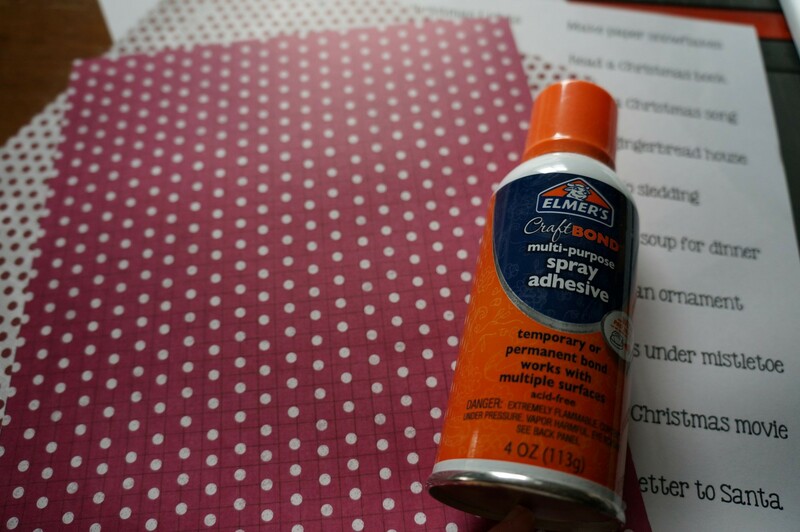 Spray the backside of your scrapbook paper with spray adhesive. Make sure your surface is protected with a cardboard box, newspaper, or something similar. I use a spray adhesive as it doesn’t make the surface lumpy like glue would and it creates a stronger bond, but you could use a glue stick in a pinch. My scrapbook paper had a double sided design so the pattern actually shows through the tags lightly with the white overlay – I love the look. You can tell a tiny bit in the bottom most tag in the picture below, but it is much more visible in person. When your two pages are stuck together, then just cut out your strips using a paper cutter or a pair of scissors in a pinch. 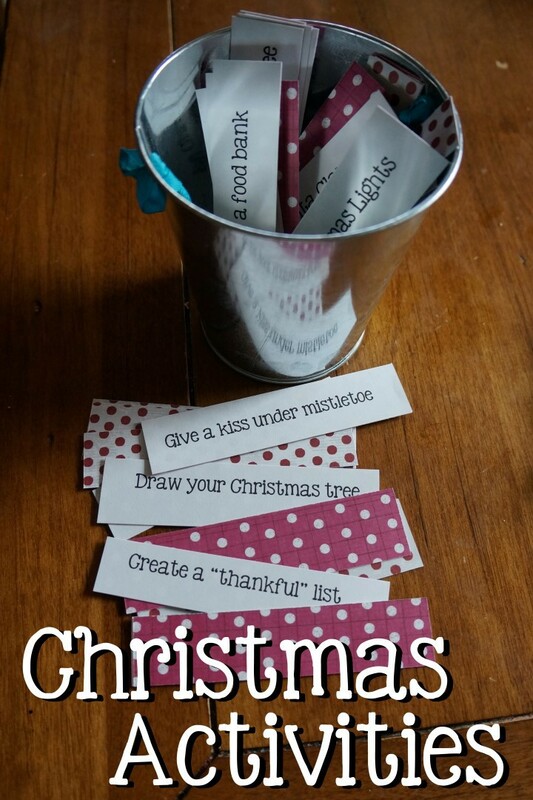 Toss your idea cards into a little jar and pull one out a day or schedule the activities to fit your schedule using an advent calendar. Keep in mind, there are 44 ideas included so you can pick and choose the ones you want to include each year. I hope this Christmas traditions printable gives you a new fun tradition to start by spending more time together having fun as a family!